Does anyone know the meaning behind this symbol? if yes can you please tell me what it is or the meaning/lore behind it ? It was the symbol for Wildstar, like in the title and the game icon, before late in the closed beta, a few months before release. I always presumed it was some kind of rune symbol but I don't know for sure. Since this is a matter of pure speculation, nothing is set in stone. 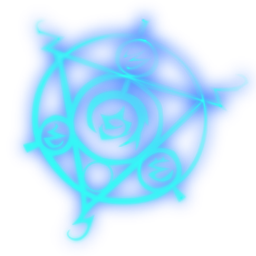 After doing a slight bit of research online a lot of people can agree that the symbol itself has no meaning besides its iconic front for the game. A user speculates, "I'm afraid I don't know the lore behind it. I suspect /u/avyiel is right that it's a sigil which is what connects to the void for spell slingers, but I don't think it's a spell slinger specific sigil (it's very similar to the spell surge sigil... but not exactly the same). I am pretty sure it is the same sigil that was used in the Wildstar icon during the beta, for what that's worth. So it may be that it's something to do with the Elden and their use of the void, but that's just speculation on my part." But that wasn't the only place where I found such speculation. I'll give you a list of links so that you can sort through what I read and perhaps continue further from there.